Hi there and welcome to Stage 1 of the Wollen Mutsen Sonnetto done in malabrigo superwash. One of the things that you to have notice is the measuring tape! Yes when I have reached the approximately length of about 7 inches, I know that I have completed the stage 1 of the hat according to the instructions. 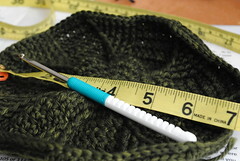 I am using a Size 3.75 mm aka F hook, but more directly a 3.75mm. This allows me to play around with the texture of the hat by deciding if I want to alternate hook sizes, sometimes you have to. Crochet as much as kniting is not a black and white craft, you have to play with the greys once in a while. This malabrigo superwas has more than one filament, but these Addi crochet Hooks are fantastic toi crochet with, smooth and fast. Now I am in route to Stage two which is bringing the hat down the sides of my head. I hope you enjoy the Journey of the Wollen Mutsen malabrigo superwash hat. Thanks for stopping by.